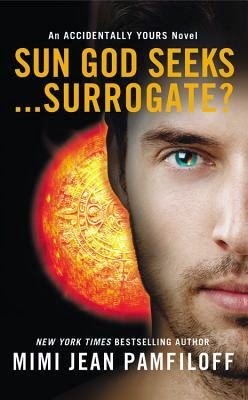 Gothic Moms: Sun God Seeks...Surrogate? 5 BLOODY FANGS & CELESTIAL STARS! "Some series begin to lack in substance as they continue, or feel like their stuck on repeat. Not this one!" Living in New York City, Penelope Trudeau has seen a lot of weird stuff-but nothing like the insane redhead who accosts her with a wild proposition. Penelope will get a million dollars if she has a baby with the strange woman's brother. With her mother dying from a mysterious disease, Penelope can use the money. Yet the terrified waitress is adamant that her womb and eggs are not for sale . . . until she meets her intended mate. He's impressively built, gorgeous, and red-hot, literally. He's a freaking immortal Sun God. For thousands of years, Kinich (Nick to his friends) didn't believe in fraternizing with humans, so procreating with them is definitely a no-no. But after one sizzling encounter with the beautiful, passionate Penelope, Nick begins to think he was wrong . . . until he realizes meeting Penelope was just another one of his crazy sister's schemes at manipulation. But now that he has Penelope in his life, he can't let her go. Especially because doing so means throwing her into the hands of his dangerous enemies. BOOK 1: Accidentally in Love with...a God? This has to be my favorite in the series', so far. Completely unpredictable from the beginning to the end, and never a dull moment. Fans also get to see their favorites and get updates on what has been going on in the lives of both Emma and Guy, and Helena and Niccolo. Starting the book off with a special kind of twist, a quiz to the reader given by none other than the great Cimil, readers will be in tears from laughing, cringing through the lovely carnage, gasping at each surprise and twist, and more than a little hot under the collar from the steam coming off of the newest couple, Kinich(Nick) and Penelope. And Vicktor may finally come face to face with his mystery dream woman. Penelope is a single young woman who is barely able to make ends meet, working hard to take care both her and her sick mother. So when Cimil approaches her with an indecent proposal, she finds it easy to say no, at first. When she meets the man in question however, her answer begins to waver, and her body begins to heat up, and five hundred grand would go a long way in helping her mother who seems to worsen by the minute. A mother with quite a few secrets of her own. Both figuratively and literally, seeing as the man in question is Cimil's brother, the Sun God, Kinich. But just as quickly as their love begins to bloom, it also may go up in flames even quicker due to a few misconceptions, misunderstandings and an X-Rated video on YouTube. And thanks to one divine rerun of The Love Boat, the world may be coming to an end. What I love most about this series' is that all of the women are the kind that take charge and except their lot in life, and while they may mope for a minute, they don't stay off of the band wagon for long. Events take place that just may leave the women in charge of things, and the war leading up to the Apocalypse just may begin earlier than planned. Readers be warned, this book does end in a cliff hangar that will leave your mouth gaping open, so it is advised to have the rest of the series' close at hand.